1. 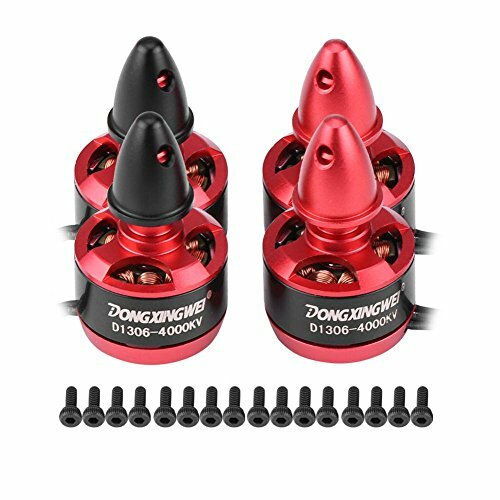 APPLICATION RANGE: This motor sets are suitable for 150, 180, 200 racing drone. 2. GOOD HEAT DISSIPATION: With advanced processing technology, the motor has good heat dissipation which ensured its long service life. 3. EFFICIENT STATOR: With efficient stator, the motor has low friction, low noise, high precision and good performance. 4. EASY INSTALL: Equipped with matching screws, it is convenient to install the motors. 5. 180 DAYS GUARANTEE: Our product have 180 days warranty, we highly appreciated any of your questions about our products. APPLICATION RANGE: This motor sets are suitable for 150, 180, 200 racing drone. GOOD HEAT DISSIPATION: With advanced processing technology, the motor has good heat dissipation which ensured its long service life. EFFICIENT STATOR: With efficient stator, the motor has low friction, low noise, high precision and good performance. 180 DAYS GUARANTEE: Our product have 180 days warranty, we highly appreciated any of your questions about our products.